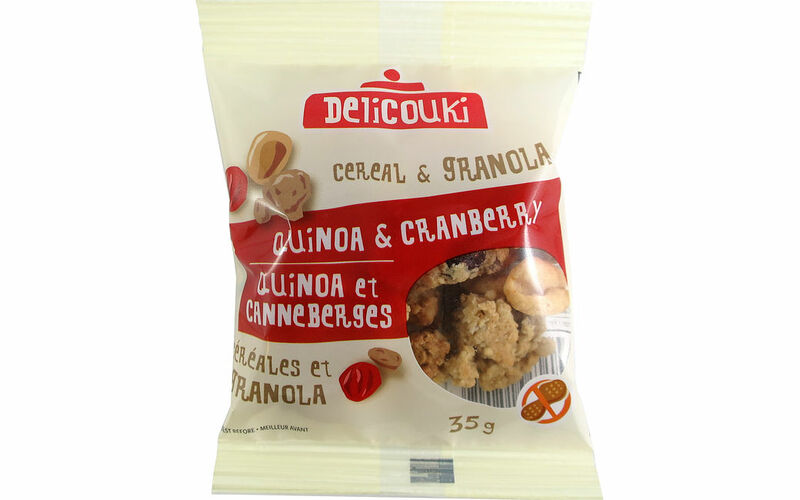 Oatmeal granola (Rolled oats, brown sugar, wheat flour, margarine (canola oil, modified palm and modified palm kernel oils (milk, soy)), water, dried cranberries (cranberries, sugar, sunflower oil), puffed cereals (black bean sorghum, quinoa), salt), quinoa crunchies (rice flour, quinoa flour, sugar). Contains: milk, soy, wheat, oat. May contain: eggs, sulphites, mustard.